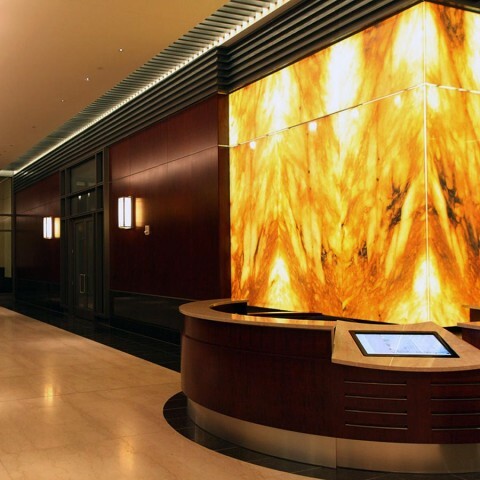 At the Saudi Arabia Cultural Mission in the U.S., visitors are greeted with a backlit onyx reception desk. Custom knife mitered edges create a clean corner, wrapping the backlit onyx material onto the return of the desk. Detailed in conjunction with the millwork design, Flat-Lite™ LED Panels are placed behind each piece of stone with separate controls to balance the lighting levels. The deep pattern of the onyx is highlighted with the backlighting, bring an exotic texture into the pristine lobby space.